You edit your writing because your mind likes to play tricks on you. You will often catch yourself writing too much on a point you don't need to emphasize and not enough on a point that is very clear in your mind but not the readers. Effective creative writing uses relevant support to bring your subject to life for the reader. Keep that in mind when you're writing. It has to come to life. Once you've gone through and trimmed out the unneeded words, you have to go back through and elaborate on topics that may have been less clear. Is there an image here? If a topic that you need to write about seems boring try adding sensory details. Focus on the five senses. Describe the smell, sight, touch, taste, and sound. 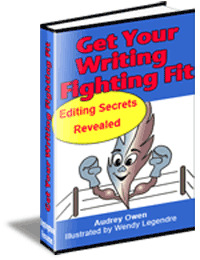 If you really want your writing to be able to kick butts and take names, there is a superb guide by Audrey Owen that can really "Get Your Writing Fighting Fit." In 11 chapters and 3 appendixes, she takes you from beginner mistakes to some techniques that even the seasoned pros can learn from. I purchased this e-book and it was one of the best (and cheapest) investments I ever made in good writing. I can recommend it, without reservations, to anyone who is serious about improving their writing.